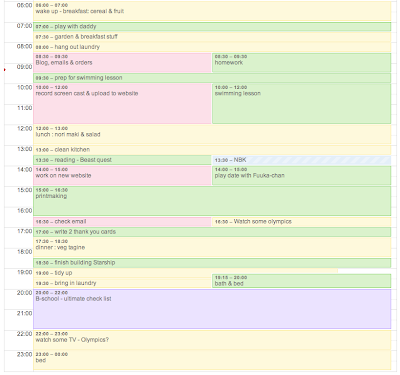 One of the points that I have picked up from my b-school course is to schedule everything. Before I would make sure the important dates were in the schedule, work related things and deadlines but that was about it. Now, I schedule pretty much everything and as my workload has increases and my schedule has got busier I have found it really helps. We get up at 6.00am as usual, so that we can spend family time together (my husband gets home late most nights). Once daddy has left for work we go through the schedule for the day. Some days I have Skype meetings so Ebi-kun does his homework during that time other days he will do it as I am sorting out my emails and orders, writing blog posts etc. Through the course of the day I make sure that I get some solid time to do some work and he gets some free playtime. I also schedule in some quality time together which is usually when we work on a project or do something crafty and we have some reading time, where he reads to me. So, here is a copy of yesterdays schedule. Yellow is family stuff, things we do together and household chores. We use google cal so that we can combine schedules. I tend to leave the computer on all day so if the opportunity arises I can jump on and get a small job checked off my list, so I have started leaving the schedule window open so we can both check what we are doing through the course of the day. 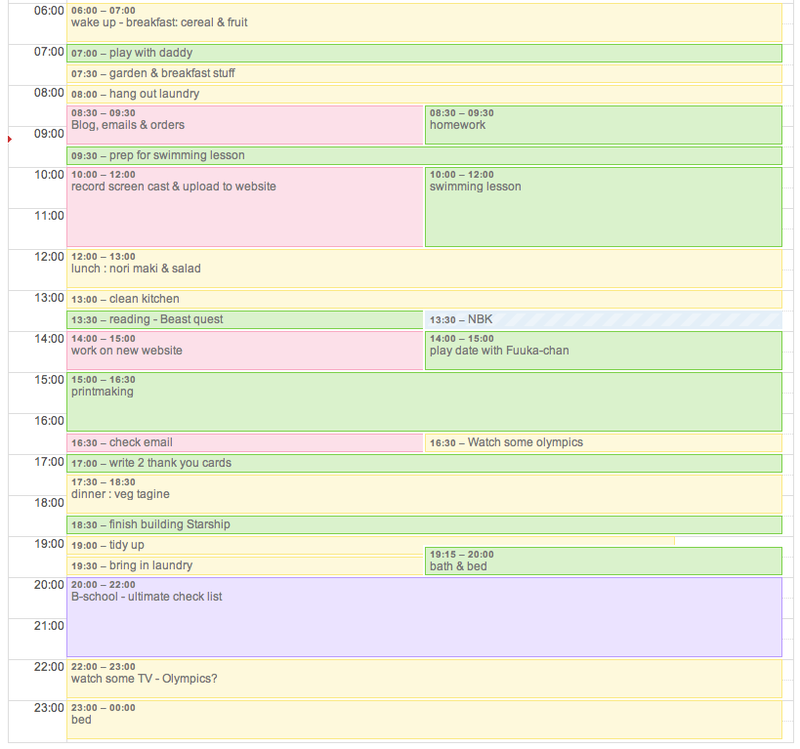 Some people might think this is over scheduling but I am telling you, I have found it to be a lot less stressful because we both know what each other expectations are, we both know which jobs have to be done and we both make the most of our free time. Of course sometimes the schedule gets changed, maybe we decide to watch a film instead of doing a project or a play date gets cancelled but having the nuts and bolts down has made a world of difference. Working from home, having Ebi-kun at home and trying to juggle all the housework too is a job in itself but I am all for stress free living. It is also really hot and sticky here at the moment so everyone is a bit more short tempered and a bit more grumpy than usual so taking stress out of the equation really helps. Give it a go and see how it works for you. Have you got any top tips for coping with the summer hols? If you are a work at home mom, how do you cope when you have the kids underfoot? please share in the comments section. If you have enjoyed this and know someone who will find it helpful, please share it! And if you want more handy tips, sign up for the weekly newsletter - It's FREE! I LOVE schedules! We have one every day too. Wayyyy less high-tech but yup, I swear by the schedule! The difference on days we do it and the days we don't is immense, everything goes much more smoothly, i actually get some work done and he actually gets his homework finished, I am now a schedule convert!